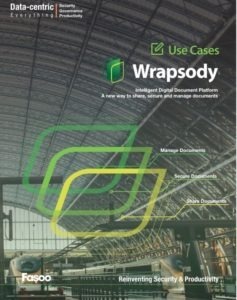 Wrapsody Use Cases – Fasoo U.S.
A system integrator creates project proposals for systems customization works delivered to its customers. Six members of a project team typically work on each proposal and need to collaborate on the different versions to produce a final version of proposal. The project team made a lot of careless errors while sharing the proposals through email or on a file server. There was a lot of confusion and wasted time during the process because someone had to continuously combine different parts of the proposal and keep track of the current version. This made it very difficult to complete the proposals by the targeted deadline. The company tried various online editing solutions to resolve these problems. Unfortunately, even though these solutions support collaboration with synchronized editing, they didn’t allow the project team to persistently manage all the documents for a project.